MG Rover was the last domestically owned mass-production car manufacturer in the British motor industry. The company was formed when BMWsold the car-making and engine manufacturing assets of the original Rover Group to the Phoenix Consortium in 2000. MG Rover went into administration in 2005 and its key assets were purchased by Nanjing Automobile Group, with Nanjing restarting MG sports car and sports saloon production in 2007. The Rover brand, which had been retained by BMW and licensed to MG Rover, was sold to Ford, which had bought Land Rover from BMW in 2000. The rights to the dormant Rover brand were sold by Ford, along with the Jaguar Land Rover business, to Tata Motors in 2008. MG Rover was formed from the parts of the former Rover Group volume car production business which BMW sold off in 2000 due to constant losses and a declining market share. BMW had acquired the Rover Group from British Aerospace in 1994 and had since sold the Land Rover business to Ford, and split-off the MINI business as a new BMW subsidiary based inCowley. MG Rover took control of the volume component of the former Rover Group (itself the remaining rump of British Leyland, which in turn had its roots in the even older British Motor Corporation, formerly Austin and Morris), which by now consisted solely of the Longbridge assembly plant in Birmingham. Of the Rover Group's other two major plants; Solihull was divested as part of the sale of Land Rover to Ford, whilst the Cowley plant was now part of the aforementioned MINI subsidiary. As part of these changes, all remaining Rover volume production at Cowley (essentially now just the Rover 75 as the Rover 600/800 ranges had already been discontinued by this point), was moved to Longbridge, whilst MG Rover would be allowed to continue manufacturing the original Mini at Longbridge until the new MINI was launched by BMW a year later. When BMW sold off its interests, MG Rover was bought for a nominal £10 in May 2000 by a specially assembled group of businessmen known as the Phoenix Consortium. The consortium was headed by ex-Rover Chief Executive John Towers. When Phoenix Consortium took over, their first loss for the last eight months of 2000 were reported to be around £400m. By 2004, the company had reduced the losses to around £80m but never made a profit. MG Rover's best year for car sales was their first full year of business, in 2001 — when they sold over 170,000 cars. In 2004 their sales had declined to around 120,000. The company ceased trading on 8 April 2005, with debts of over £1.4 billion, after a proposed alliance with SAIC collapsed. In June 2004, it was learned that Shanghai Automotive Industry Corporation had signed a joint venture partnership to develop new models and technologies with MG Rover. This led to much speculation among the British media suggesting the Chinese company was poised to launch a takeover. Later that year, in November, news broke of an agreement between the two companies to create a joint venture company to produce up to a million cars a year, with the production shared between MG Rover's Longbridge site and locations in China. SAIC were to have a 70% stake in this company in return for a £1 billion investment, with MG Rover owning the remaining 30%. However, this agreement had to be ratified by the Chinese government, specifically its National Development and Reform Commission (NDRC). 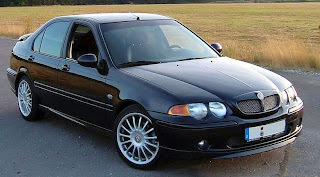 The Commission held the opinion that if BMW could not make a success of Rover, then it would be hard for SAIC to do so. On 8 December 2004, Tata of India, which had cooperated over the export of the Tata Indica as the CityRover, threatened to cease its agreement with MG Rover if the SAIC tie-up went ahead, according to the Indian press. Tata claimed the report was inaccurate two days later. SAIC purchased the technical rights to manufacture Rover's 25 and 75 models, and for the Powertrain Ltd business, for £67M. It did not acquire the Rover name, which was still owned by BMW at the time (See 'Brands' below). In January 2005, it was revealed that British Prime Minister Tony Blair had intervened to support the alliance between MG Rover and SAIC. MG Rover could not give a date on which the agreement would be finalized. Figures released by the company showed that the sale of Rover-branded cars fell in 2004 compared to 2003. In April 2005 it was reported that the partnership deal with SAIC was in trouble because the British Government had decided to withdraw its offer of a £120 million loan to keep the deal going. On 7 April 2005 the company announced that it was suspending production because of component shortages. Later in the day, it was announced by Patricia Hewitt, the Secretary of State for Trade and Industry, that the company was being placed in receivership. Her statement was based on a conversation with MG Rover chairman, John Towers. It was later denied by MG Rover Group, although the company admitted that it had engaged PricewaterhouseCoopers, the accountancy firm, to advise on its current financial situation. In the event, MG Rover placed itself inadministration on 8 April 2005, a different status from receivership under British law. On 8 April 2005, British Prime Minister Tony Blair and Gordon Brown, the Chancellor of the Exchequer, and Richard Burden, Labour M.P. for Birmingham Northfield visited Tony Woodley at the offices of the Transport and General Workers' Union in Birmingham and stated that there might be some hope for the future of the company, although not the original deal agreed with SAIC. In the media, any news about MG Rover was overshadowed by the Pope's funeral and the problems of the register office marriage of the Prince of Wales and his bride. On 10 April 2005, MG Rover announced that they had received a £6.5M loan from the British Government. This would cover workers' wages for one week while buy-out proposals were made to SAIC. The same week, SAIC denied it had ever made an offer to buy MG Rover and threatened to sue anyone who attempted to make the 25 and 75 models. On 15 April 2005, it was announced that SAIC had once again rejected pleas to buy out the company. With no other rescue deal in the pipeline, the administrators were not in a position to seek further funding from the government and announced that redundancy notices to Longbridge staff would be issued. By the end of April 2005, Sir Richard Branson had reportedly expressed an interest in buying the remaining assets of the company for the purpose of reviving the marque in order to enter the hybrid automobile market, and several other parties were also rumoured as wishing to buy the remnants. These included two Russian businessmen, although one of them denied any interest in buying the company's assets. The Iranian state-owned car manufacturer, SAIPA who had worked with MG Rover installing the K series engine in a car for the Iranian market that was based on the old Mazda 121 and Kia Pride, were also rumoured to be potential buyers. SAIC had claimed that it had already acquired Intellectual Property Rights in some Rover product for £67million in the autumn of 2004, including the Rover 25, the Rover 75 and the Rover Powertrain K-series engine, but the Administrators advised that there was still interest in saving some other parts of the company, including MG, and 13 May 2005 was set as the deadline for bids from potential investors. On 20 May 2005, the Administrators announced that, after considering numerous proposals, they had entered talks with two unnamed "overseas companies" with a view to restarting one or more of the Longbridge production lines. Nevertheless, the following week they informed creditors that they by then expected the company to proceed instead to a creditors' voluntary liquidation, setting the date for a preliminary Creditors' Meeting to be held in Birmingham on 10 June 2005. At that meeting, creditors learned that so little of value was left in the company that there would probably be negligible or even no repayment of its outstanding debt and that, although three bidders were then still negotiating to acquire the company intact as a going concern, the Administrators had instructed their agents to prepare for the piecemeal sale of the very few remaining assets in the event that satisfactory negotiations for the sale of the entire business were not concluded. On 14 July 2005, it was reported that Magma Holdings, a financial group including former Ford Motor Company and General Motors executives, working in conjunction with SAIC, would be making an offer for the assets of both MG Rover and engine maker Rover Powertrain which, if successful, would see at least some production being restarted at Longbridge, and that talks with the other two interested parties – China's Nanjing Automobile Group and Project Kimber (a consortium of Birmingham businessmen led by David James) – were still in progress. More than 6,000 workers at MG Rover lost their jobs when the company went into liquidation. As many as 25,000 jobs were reported to have been lost in related supply industries, meaning that the total number of job losses brought on by MG Rover's collapse was somewhere in the region of 30,000. On 18 July, Magma Holdings and SAIC formalized their bid with a reported offer of £60M, with a number of additional conditions. However, that offer was not well received, and on 22 July, the Administrators announced that the principle remaining assets of the group had been sold to the Nanjing Automobile Group for around £53M, with a deposit of around $5M. Nanjing Automobile Group indicating that their preliminary plans involved relocating the Powertrain engine plant to China and splitting car production into Rover lines in China and MG lines in the West Midlands(though not necessarily at Longbridge), where a UK R&D and technical facility would also be developed. But on 27 August, The Daily Telegraph reported that the balance of around £47M, due on 22 August had not been paid. Citing confidentiality, the Administrators declined to comment. Because the Rover 45 range produced at Longbridge had still had significant Honda content, originating from the companies' legacy partnership with Rover and British Leyland, Honda executives moved quickly to terminate the licensing agreement and removed tooling and assembly equipment for the car from Longbridge. In late October, key ex-workers received letters from Nanjing Automobile Corp offering 10 months' work dismantling plant at Longbridge for reassembly in China while talks with GB Sports Cars continued. However, after announcing that the UK government had not offered any substantial assistance in either grants or loans, Nanjing Automobile was also reported to have begun negotiations with at least two other potential partners, including "a wealthy San Francisco family", and, in early November, Nanjing committed to making every effort "to resume production [at Longbridge] at the beginning of 2007". 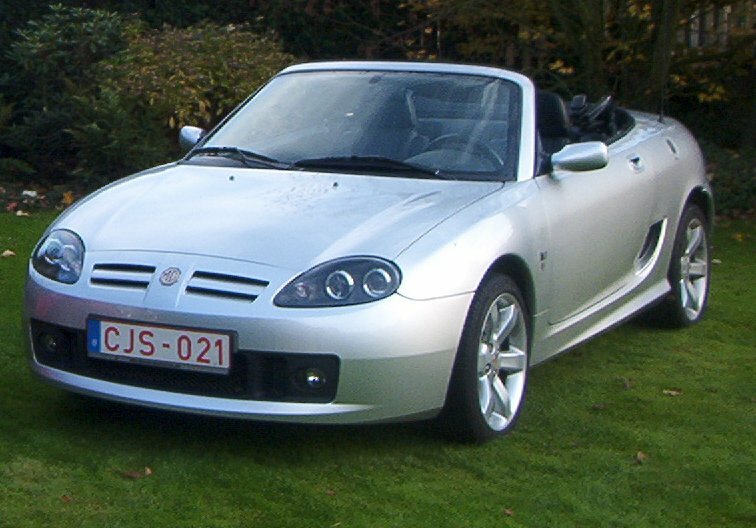 In August 2008, more than three years after the facility had closed due to MG Rover's bankruptcy, assembly at Longbridge of a lightly revised MG TF roadster for the European market, from Chinese-built semi knock down (SKD) kits, restarted. The UK Government commissioned reports into the collapse of the company. The National Audit Office reported in March 2006 on the financial support provided to the company. It commended the DTI's contingency planning in 2004, but questioned whether the loan made in April 2005 achieved value for money. The DTI commissioned accountants BDO Stoy Hayward to report on the collapse of the company; this took four years to complete at a cost of £14.8 million. The firm issued its report to business minister Peter Mandelson in July 2009, and it was published on 11 September 2009. The report revealed that five executives took £42m in pay and pensions from the troubled firm as it collapsed. The report focused its criticism on the Phoenix Four and chief executive Kevin Howe who oversaw its collapse. Other findings included evidence of a personal relationship between Nick Stephenson and a consultant who he paid more than £1.6m in the 15-month period up to April 2005. Meanwhile, "Evidence Eliminator" software installed by Mr Beale deleted documents which were likely to have been relevant to the investigation. The investigators further accused Mr Beale of giving "untruthful" evidence during interviews. Conservative business spokesman Kenneth Clarke said it was right the report criticised the Phoenix Four, whose behaviour was "disgraceful". Lord Mandelson said the Phoenix group had not shown an "ounce of humility" about the firm's demise and they owed an apology to the firm's employees and creditors. The Serious Fraud Office declined to mount an investigation, but Mandelson instructed lawyers to prepare a case to disqualify the key figures at Phoenix from future company directorships. The MG Rover range initially consisted of five cars: the Mini, Rover 25, Rover 45, Rover 75 and MG F along with car-derived van derivatives of the 25. The Mini was only built under temporary licence during the first five months of MG Rover's existence, and since the 1980s had only been built in limited numbers. After production finished, previous owner BMW regained the rights to use the brand, and did so on an all-new car that was launched in 2001: MINI. The Rover 25 and Rover 45 were recently facelifted versions of visibly ageing mid-1990s designs, but production figures had been slightly decreased due to a fall in demand, even though the Rover 25 had been Britain's best-selling car of the month in April 2000. Both cars still had significant Honda content within their design (for example, the 25 still used underpinnings based on the 1989Honda Concerto and the related Series II Rover 200, whilst the 45 was essentially a rebadged Honda Civic/Domani outfitted with a K-series engine) - a legacy from Rover's one time partnership with Honda, which necessitated paying the Japanese company significant royalties on every car sold which further dented the profitability of those models. The acclaimed Rover 75 was little over a year old, and after a slow start sales were rising. An estate version was launched following the shift of production from Cowley to Longbridge. The replacement for the MG F, the MG TF sports car was, inevitably, a relatively low-volume product, but it had consistently been the most popular car in its sector since its 1995 launch. 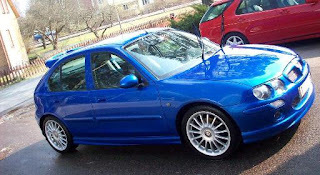 The Rover 25 and Rover 45 endured disappointing sales throughout MG Rover's existence, though their MG ZR and MG ZS sports variants proved popular from their launch in 2001. 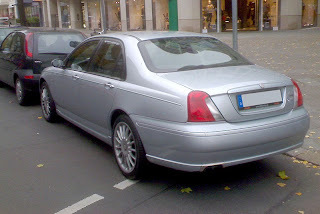 The Rover 75 and its MG ZT sports variant enjoyed more popularity. The range further expanded in 2003 with the launch of the smallest model, the Indian-built CityRover, built as part of a venture with Tata, and a flagship model, the MG XPower SV, based on theQvale Mangusta. 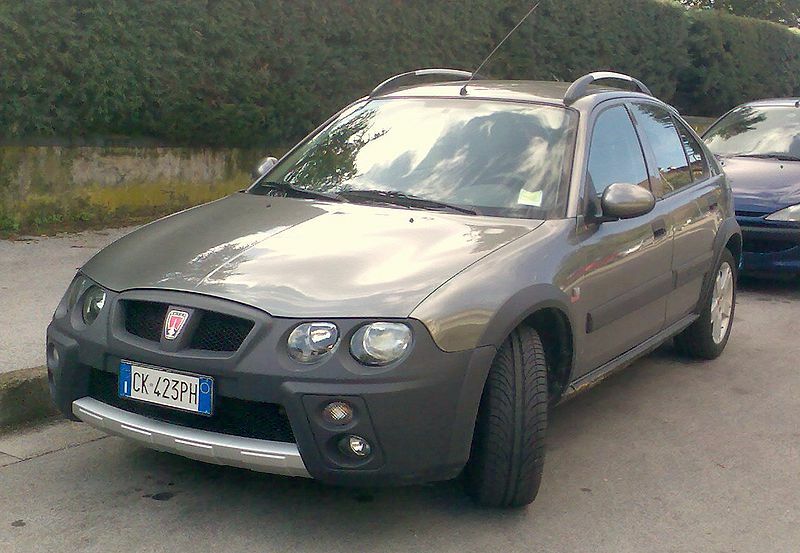 Both cars, however, failed to achieve the sales figures that MG Rover had hoped for. Early 2000: MG Rover was formed as the part of the former Rover Group's mass-market car business which BMW sold to the Phoenix Consortium for a nominal £10. 2001: MG Rover buy the factory and the rights to the platform of the Mangusta car from Qvale of Italy for an estimated £10 million. 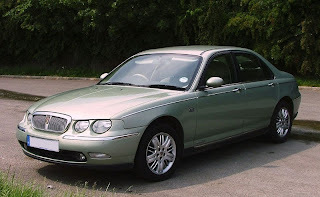 2001: The Rover 75 Tourer is launched. 2001: The MG ZR, MG ZS and MG ZT (based on the Rover 25, Rover 45, Rover 75 respectively) are launched as sporting alternatives to the standard Rover models. 2002: A revised version of the MG F is launched as the MG TF. 2002: MG Rover agrees to collaborate with Tata of India. 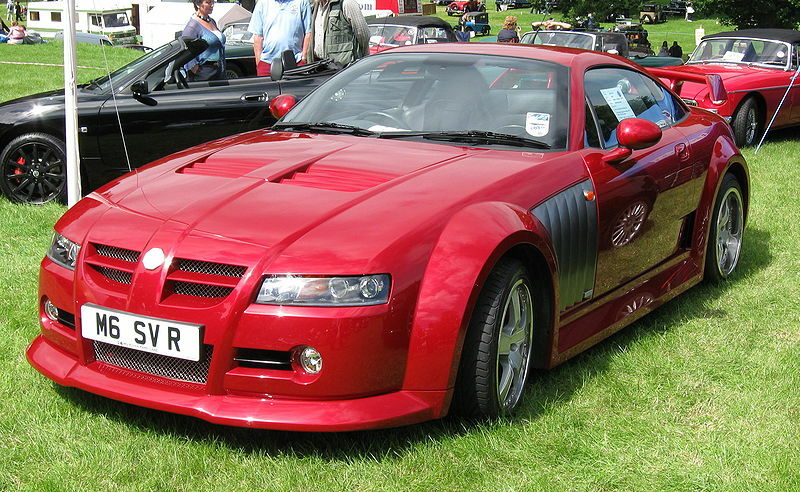 2003: MG Rover launches the new MG XPower SV and SV-R sportscars, prices start at around £65,000. The car is based on the Qvale Mangusta and uses the Ford 4.6 litre V8 engine with two different power outputs. 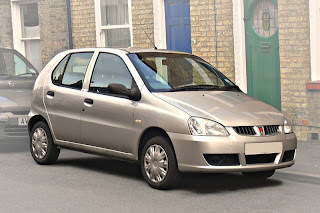 2003: MG Rover launches the new CityRover - a small 5-door hatchback city car, based on the 1998 Tata Indica, which was the product of 2002's collaboration with Tata Motors. 2003: MG and Rover launches V8 variants of the Rover 75 and the MG ZT. 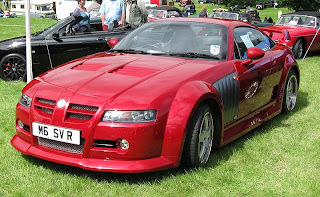 2003: MG Rover launch a restyled version of the Rover 25, the Rover Streetwise. Referred to as an "urban on-roader", it has SUV-like styling. 2003/04: MG Rover sell the Longbridge factory to St. Modwen Properties on a lease-back basis to raise funds. 2004: MG Rover launches facelifted versions of the Rover 25/45/75 and MG ZR/ZS/ZT/ZT, with revised front and rear ends. Rover 25/45/Streetwise and MG ZR/ZS also get revised fascias. 2004: MG Rover enters in talks with Shanghai Automotive Industry Corporation (SAIC) about a possible collaboration. 2004: MG Rover sell design rights to the Rover 25 and 75 to SAIC to raise money to keep the business afloat. 2005: Negotiations on possible joint venture with SAIC stall, and MG Rover collapses. Price Waterhouse Coopers called in as administrators. 2005: Nanjing Automobile Group acquires the entire assets of MG Rover. 2005/06: Nanjing Automobile Corporation announces plans to build cars at Longbridge after signing a deal to lease the site for 33 years. 2006: SAIC sets up a new brand called Roewe after losing the right to buy the Rover brand name, and later launches a model based on an extended Rover 75 platform, called the Roewe 750. 2006: Ford buys the rights to the Rover marque, meaning that only the MG badge can be used on the new range of Nanjing-built cars. 2007: Nanjing Automobile Corporation restarts MG TF production in China. 2007: SAIC and Nanjing Automobile Corporation announce a tie-up and on the 26 December NAC becomes a part of SAIC. 2008: Production of the limited edition MG TF LE500 commences at the Longbridge plant. 2009: Production of the standard MG TF 135 commences at Longbridge. MG Rover sponsored Aston Villa Football Club from 2002 to 2004, with Villa's home kit advertising Rovers and the away kit advertising MGs. Also, the company had sponsored the popular ITVmurder drama series Midsomer Murders; where a range of MG Rover cars were presented in the programs. All of the following brands were controlled by MG Rover, and were formerly the property of British Leyland. The Rover brand was used under license from BMW, and was sold to Ford following the collapse of MG Rover; it was subsequently bought in 2008 by TATA. The MG XPower brand was created by MG Rover for their motorsport subsidiary, MG Sport and Racing Ltd. in 2001. 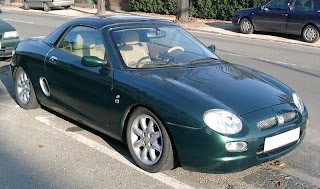 It was subsequently used for the MG XPower SV sportscar, a higher powered version of the Qvale Mangusta, in 2002. After the demise of MG Rover, assets of MG Sport and Racing relating to the XPower SV were acquired from PWC, the Administrators, by the newly formed MG Sports and Racing Europe Ltd. However this company's use of the "MG" trademark resulted in a legal dispute with Nanjing Automobile (Group) Corporation, which had also acquired assets of the defunct MG Rover Group. This case was won by Nanjing in February 2010. Last updated on 17 August 2013 at 09:31.